Callicarpa dichotoma, or Purple Beautyberry, is a small shrub native to China, Japan, and Korea which is grown for it’s ornamental purple berries. The arching branches are covered with clusters of bright fruit in September and October. 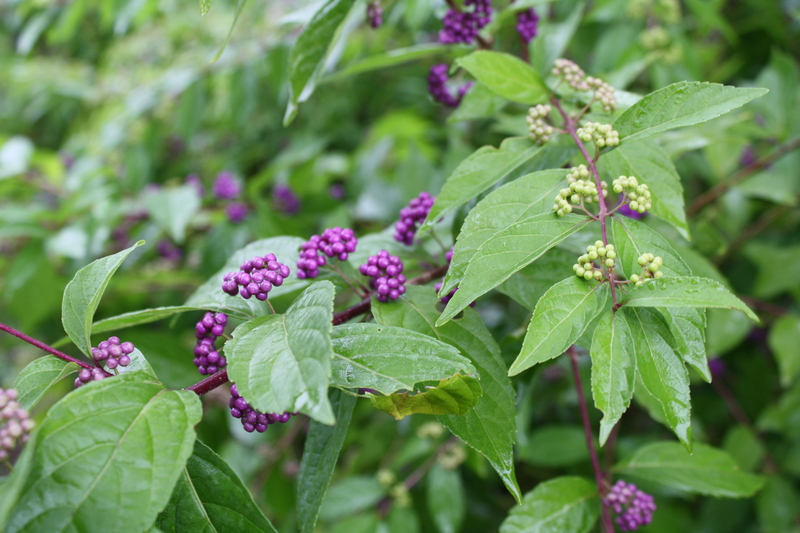 The Purple Beautyberry at the Botanical Garden is at the edge of the Ericaceous garden, near the firelane. If you walked by this planting at any other time of year you wouldn’t notice it. In the spring it gets cut to the ground, as the branches tend to be winter killed here. Growth begins late in the spring.The 2-3 inch elliptical leaves are medium green and the entire plant is quite unremarkable. 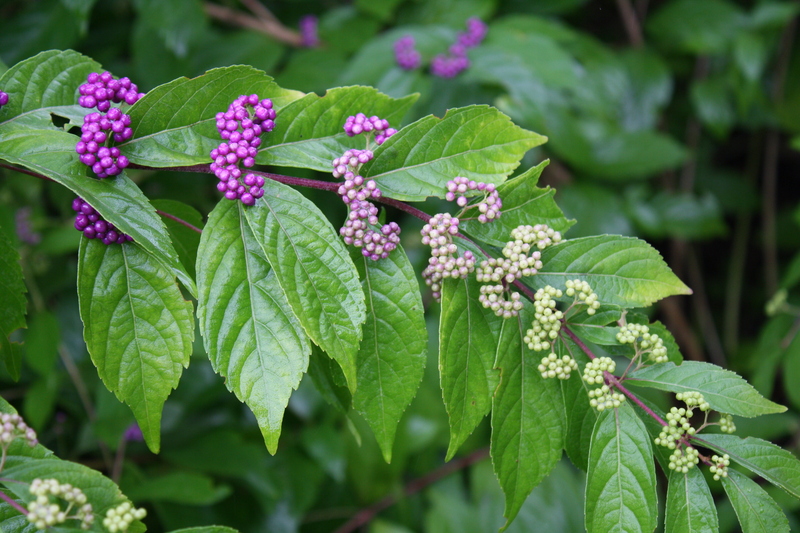 By mid summer tiny pink to lilac flowers appear along the branches in the leaf axils. At the end of summer the little white berries are visible, and as they slowly color up, they become a purple like no other color in the garden. Right now it looks great! In addition to the fall show, I’ve read that birds and other wildlife eat the berries. All in all a nice surprise to come across at this time of year. This entry was posted in Botanical Gardens, Gardening, Uncategorized and tagged fall color on October 26, 2010 by uribg. Anmeone japonica 'Queen Charlotte' resting on sedums. Thoughts of the garden in the fall could be really gloomy. Spring is so hopeful, and summer is glorious. Fall leads to…winter. No garden there. So, to stay cheerful, I’m going to talk about the great fall flowers blooming now at the Botanical Garden. First is one of my favorites, Sedum ‘Autumn Joy’ (Hylotelephium). It’s interesting all year, with green flower heads that look vaguely like broccoli in the summer, but right now it really shines. The pinkish flowers turn a darker purplish- red at this time, eventually to deep maroon and then brown. I leave it into the winter to catch frost and snow, for something to look at in the quiet November landscape. Next: Fall Blooming Anemones. They don’t look golden and fall- like, they look like spring all over again. The white ‘Honorine Joubert’ and the pink ‘Queen Charlotte’ are both blooming now in the sunny border. In some spots, the tops were eaten off by deer earlier, but there are still flowers on the 3-4 foot tall stems. Agastache ‘Heatwave’ has been a real eye-catcher since it was planted three years ago. These huge (3 ft wide x 4 ft tall) plants in the mint family have long stems of pink flowers in the middle of summer. Hummingbirds and bees adore them. 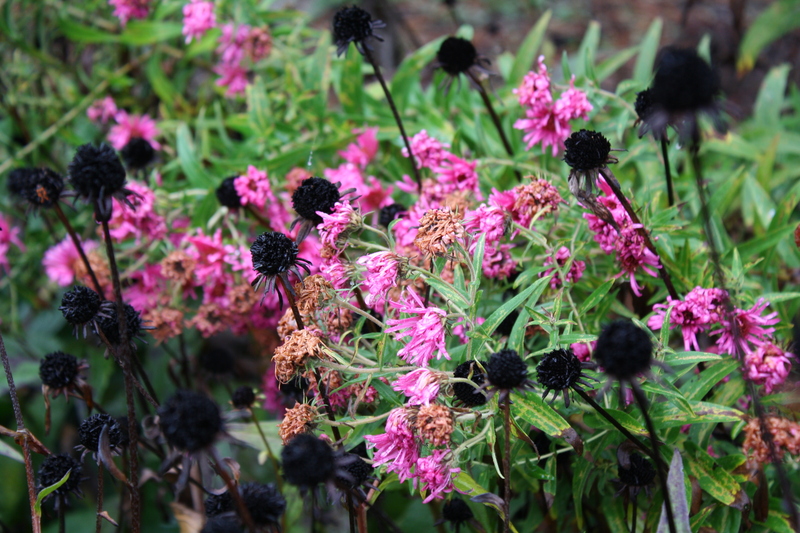 Slowly the petals fall off but the pink calyxes remain, darkening as the days go on. At this time of year they still look good and are a bright spot in the garden. Toad Lily, Tricyrtis formosana, is a great fall-flowering shade plant. (It’s not a lily and toads don’t eat it! )They are inconspicuous most of the year, but at their best right now. Small ( two-inch) flowers with white to pink petals with purple spots range along the curved stems of the 24-inch plants. These were also tasted by deer earlier and are flowering nevertheless. New England Aster (Symphyotrichum novae-angliae) is another fall perennial that most people know. They come in shades of pink and purple and rarely white, with yellow centers. 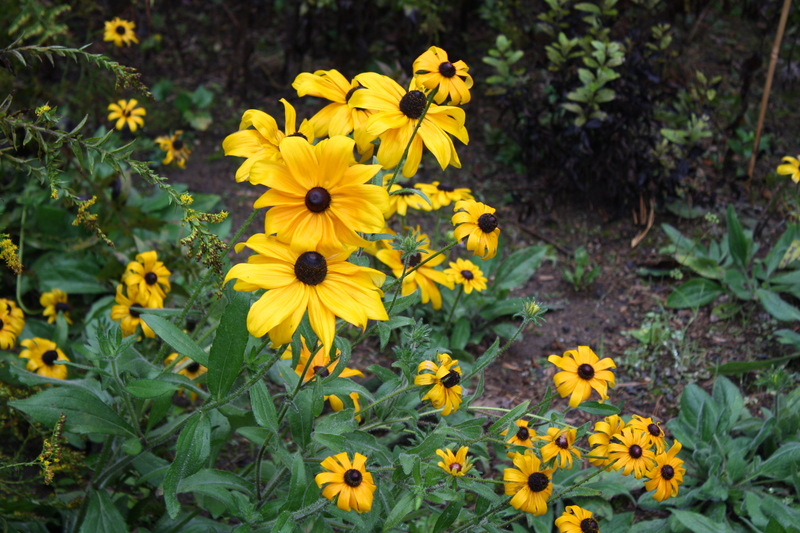 Many cultivars have been developed from this easy to grow plant, which is found in the wild throughout New England. 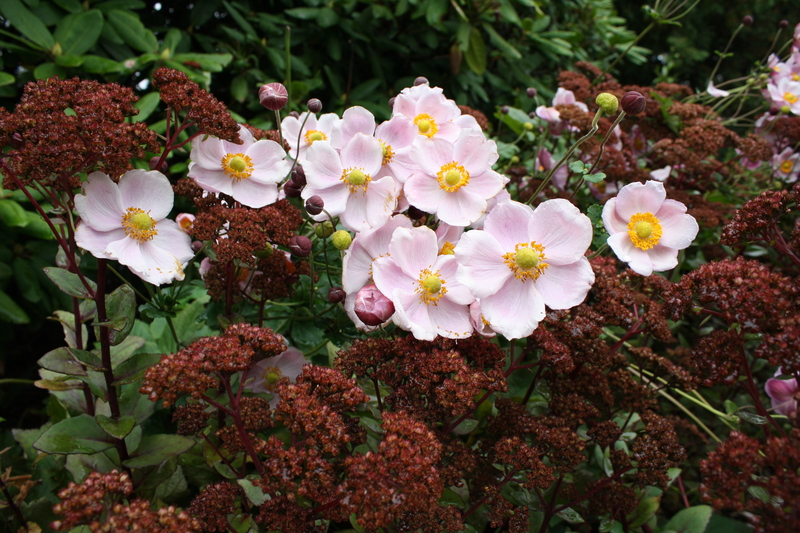 My current favorite is ‘Alma Potschke’ , a beautiful warm rose pink that blooms for weeks in September. It’s just about done but I had to include it, it’s been such a pleasure to see in the garden. White Snakeroot (Ageratina altissima) is blooming now in the sunny border, with clusters of bright white, fluffy looking 1/2 inch flowers. It’s an eastern US native and grows very well here with a little shade. Snakeroot is not much to look at the rest of the year but plays it’s part at the end of the season. There are plenty of annuals still around…the zinnias, petunias, and sunflowers still blooming away even as they begin to look a little tattered. Some late summer perennials hang on with a few flowers here and there until frost — Gaura, Rudbeckia, and Phlox come to mind. The location of the plant makes a difference too. The Actaea in the sun has long since gone to seed, but the Actaea at the shady end of the Kinney Wall still has flowers. OK, I’ve cheered myself up. Color and life in the garden go on, and will for a little while longer. This entry was posted in Botanical Gardens, Gardening, Uncategorized and tagged annuals, fall color, perennials on October 5, 2010 by uribg.